Advantages: High quality of printing, full colour format on glossy pages, inspiring photos of superdetailed models. Disadvantages: Not a comprehensive report of the shows. This full colour, image intensive magazine from Periscopio Publications covers six major international model shows from 2001. The magazine is beautifully printed on high quality paper and is perfect bound with a card cover. The first show covered is the IPMS UK 2001 annual competition. No less than 23 pages detail the high quality entries from all categories of the show. As the magazine is of Greek origin and most readers will be of that nationality, four pages are dedicated to the IPMS Hellas entries. The quality of the images of the entries is enough to make the average modeller want to take up needlepoint. There are some spectacular models. Many super-detailed efforts in the aviation classes are breathtaking. Of particular note is a Hasegawa 1/48 P47D by Zdanek Sebesta of the Czech Republic who took gold in Class 12, a 1/48 Tamiya Swordfish by Megas Tsonos of IPMS Hellas and a Hasegawa Macchi MC 202 by Antonio Morant. Of note in Dioramas is Philip Ware’s entry of a Fokker E.V./D VIII diorama with no less than 32 figures, 27 of which are standing or sitting on the wing of the aircraft. Jim Baumann of IPMS UK won several classes in the Maritime realm. His ship models are beautifully displayed and elegantly finished. The US Spring shows (MFCA Valley Forge and the Atlanta shows) are featured next. Eighteen pages of nothing but spectacularly finished figures from all periods. My poor words are of little use describing these excellent entries. They are a visual feast. 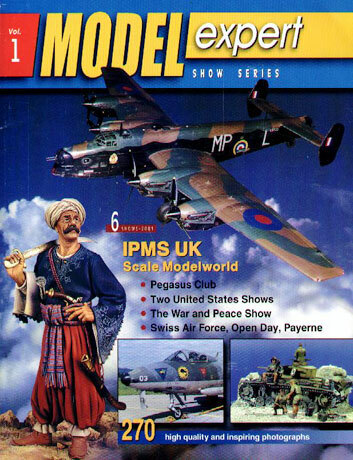 Next up is a feature on the first Pegasus Historic Miniature Club show held at Thessaloniki, Greece in October 2001. Twenty two pages cover this event which is primarily an armour and figures contest. There are some exceptional dioramas and scratch building efforts featured in both domains. Now the focus of the magazine shifts to real stuff with two features. The first is on the 2001 War and Peace Show held in the UK with six pages of images from that event and finally, a photo feature on the Swiss Air Force Open Day at Payerne. These eight pages have shots of Swiss Hornets, Mirages, F5s, Hunters and rotary wing aircraft. This volume is not meant to be a comprehensive report of the shows but an inspiration to modellers everywhere. And it does just that. This is an exceptional effort by the publishers. Thanks to Stelios Demiras from Periscopo Publications for the review sample.